Archive for the ‘2013 Shutdown’ Category. My company has been sued a few times for slip and fall type stuff but I have never in my life been the plaintiff in a legal action. As is perhaps appropriate given my political leanings, my first ever suit was against the the Federal government, specifically against the Forest Service seeking an injunction against their closure of the campgrounds we operate in the recent shutdown. I had feared that we would lose the opportunity to set a precedent. Since the shutdown was over I though the Court might consider this issue moot. But apparently one can continue with such litigation to set a precedent if there is reason to think the circumstances will recur. And the government attorney was kind enough to make a statement right in the court transcript (granted in context of a different argument) that this same shutdown situation is likely to reoccur as soon as early next year. [the Forest Service has] nothing to do with the administration and management of the campgrounds other than the inspections at any given time. So, what they have done is unreasonably close these parks, preventing the concessioners who pay a premium in order to get this permit and lease the property under the requirements in this permit -- and the Forest Service was very ill-advised to make the decision to close these grounds under these circumstances, where you have given up the maintenance and administration of these campsites. I understand the overall obligation for public safety, but you have delegated that to private entities. And you took it away when it wasn't costing you a dollar to leave it as was. And in fact, that's where we get into the restraint of trade and the fact that there are losses which are most likely uncompensatable. By the way the case was National Forest Recreation Association et. al. vs. Tom Tidwell. My company, among others, was al. I will leave it as an extra credit exercise for the reader to explain how this text justifies either a) spending extra money to barricade war memorials on the Washington Mall or b) closing privately-funded parks that take not a single dime of government money. All these tests have everything to do with limiting government expenditures, not limiting citizen access to public lands. We had some delays (in part because the government is taking a holiday from the shutdown today, so everything is REALLY closed) but we file our lawsuit seeking a temporary restraining order on the US Forest Service in the morning. All the maintenance at this site, as well as all cleaning, utilities, security monitoring, staffing, customer service, etc. are provided and paid for by a private concessionaire that does not take one dime of government money. The "our ability to perform maintenance" is incredibly disingenuous, because over the course of a year likely no US Forest Service maintenance person even steps on the property. The last half of the message therefore has absolutely nothing to do with the first half. 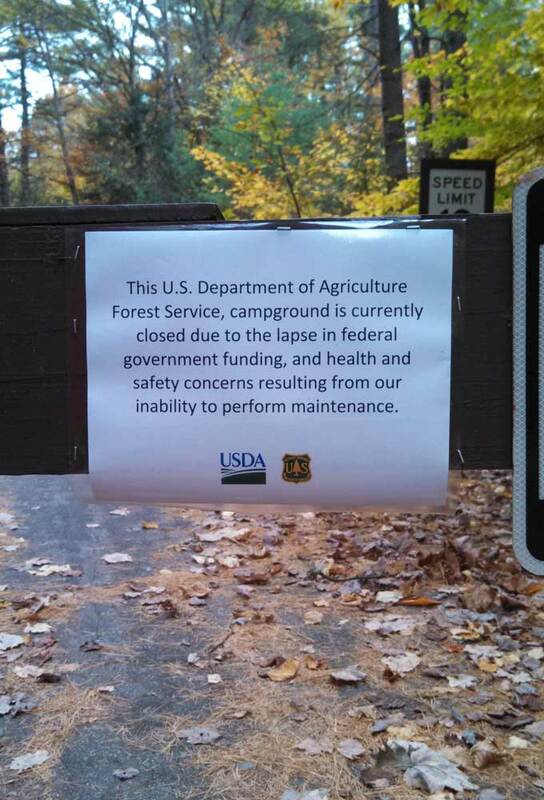 The campground is closed and not being maintained because the US Forest Service has arbitrarily suspended the concessionaires contract in an apparent attempt to make the shutdown more painful for the public. I received a copy of this letter on Friday. 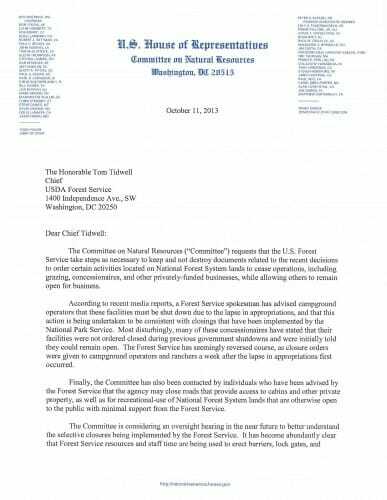 It is a letter from the House Natural Resources Committee to the head of the US Forest Service Tom Tidwell, threatening investigations and hearings over closures of privately-funded, concession-operate parks in the Forest Service. Click to enlarge either page. I know regular readers my have had enough of the park shutdown posts but this blog gives me a good spot to post updated information for the media and the public. To that end, all of my park shutdown posts are here. Fox Business has done an article on the government closing of privately funded parks. One interesting note - many state parks operate on Federal land using almost exactly the same king of lease contract (called a special use permit) we have to privately operate parks and campgrounds. If private parks with this type of lease with the USFS have to close, shouldn't state parks as well? For example, both Slide Rock SP in Arizona and Burney Falls SP in California operation using the same kind of lease as we do. I got this email a few minutes ago. I just wanted to thank you for the letter you wrote to our senators and congressmen. My fiance and I are scheduled to be married this Saturday at Red Rock Crossing. 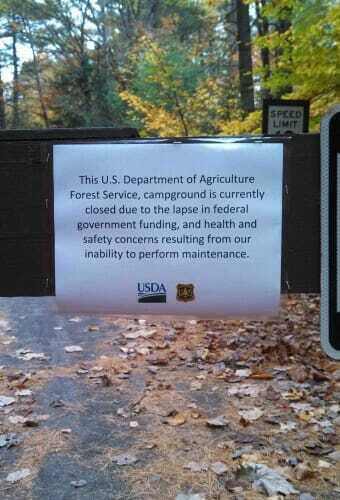 On Tuesday, I called and was told that the park would be open and unaffected by shutdown. As you can imagine, the news today has me very worried. We have spent literally thousands of dollars to have a special couple of hours in the park with our families who are flying in from all over the United States and the thought of not being able to have our wedding in our dream location is upsetting to say the least. I hope and pray that your parks and campgrounds continue to stay open. 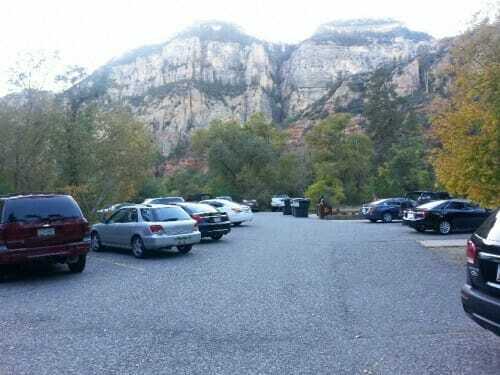 Red Rock Crossing is a privately-operated campground that the USFS has slated for closure Friday not because it uses too much Federal money (it in fact uses none and pays rent to the Treasury) but because the White House apparently wants to artificially increase the cost of the shutdown. Well, you got your wish Mr. President. PS- for those who are concerned, we are going to find a way to help this guy get married, even if I have to sneak them into the facility myself. My company, based in North Phoenix, operates over 100 US Forest Service campgrounds and day use areas under concession contract. 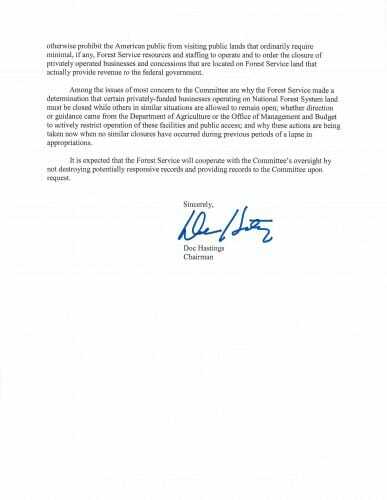 Yesterday, as in all past government shutdowns, the Department of Agriculture and US Forest Service confirmed we would stay open during the government shutdown. This makes total sense, since our operations are self-sufficient (we are fully funded by user fees at the gate), we get no federal funds, we employ no government workers on these sites, and we actually pay rent into the Treasury. However, today, we have been told by senior member of the US Forest Service and Department of Agriculture that people “above the department”, which I presume means the White House, plan to order the Forest Service to needlessly and illegally close all private operations. I can only assume their intention is to artificially increase the cost of the shutdown as some sort of political ploy. The point of the shutdown is to close non-essential operations that require Federal money and manpower to stay open. So why is the White House closing private operations that require no government money to keep open and actually pay a percentage of their gate revenues back to the Treasury? We are a tenant of the US Forest Service, and a tenant does not have to close his business just because his landlord goes on a vacation. 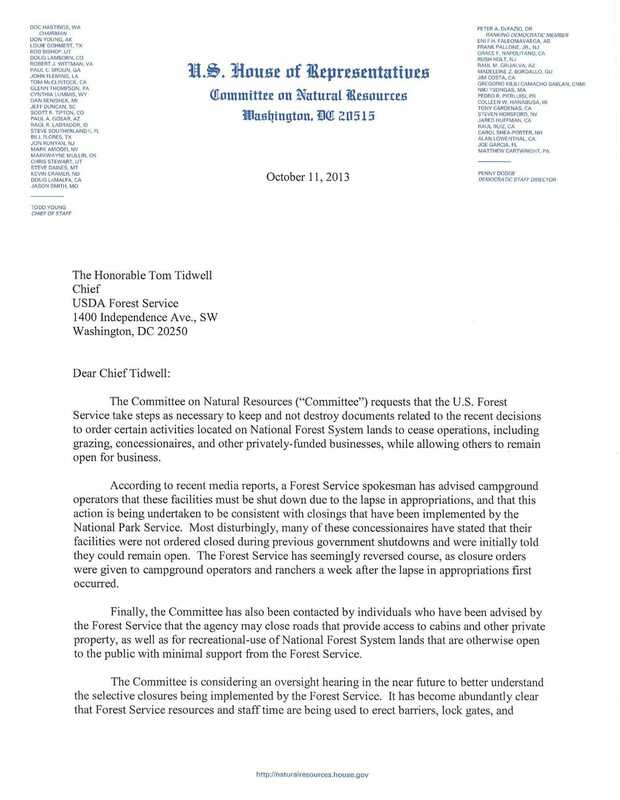 I urge you to help stop the Administration from lawlessly taking arbitrary and illegal actions to artificially worsen the shutdown by hurting innocent hikers and campers. I am not asking you to restore any funding, because no funding is required to keep these operations open. I am asking that the Administration be required to only close government services that actually require budget resources.